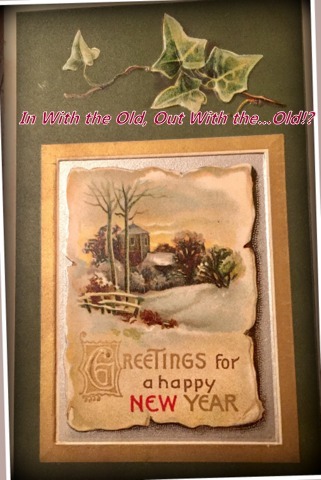 Out With the Old, In With the …Old!? HAPPY NEW YEAR! It’s a clean slate. Out with the old, in with the new…wait! Some things are simply better “old”, or “vintage” (my favorite word). Here’s a look at some of my favorite things whose modern counterparts are not an improvement. As I write this, I’m drinking a seltzer from a chic little 50’s glass, listening to 1940’s tunes. (Is there any music better than Louis, Ella, or Billie)? Yes, there’s many modern conveniences I can’t imagine life without. Smartphones – I love streaming music, the ability to “Google” anything, anywhere instantly, or reaching my teen wherever she goes. 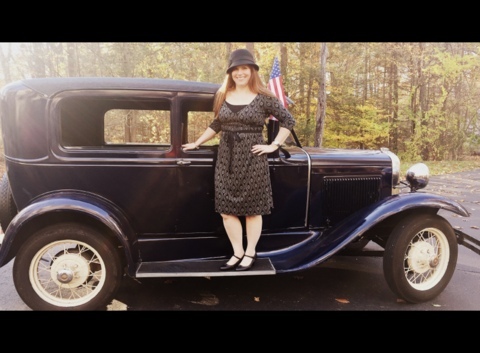 Recently, we were treated to a ride in our friends’ 1930 Ford Model-A! Almost all original, it was like a time machine! However, with its wooden frame and no seat belts, I realized how far we’ve come with technology, safety and comfort in automobiles. (Though classic cars from the 30’s to the 60’s can NOT be beat in style)! What a thrill to ride in this beauty! Still, I was “born in the wrong generation” for many reasons, and my adoration for vintage is also an appreciation for things well-made. Not everything “new” is “better”. She’s only 5 inches tall and wide. I call her “Shirley Temple”. At a fabric store recently, my daughter noticed new sewing machines, snubbing her nose at how flimsy they seem compared to vintage machines. 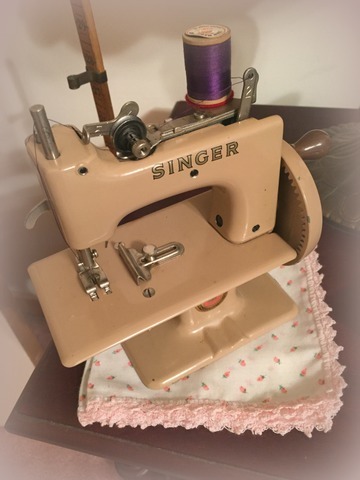 I’ve already blogged on the virtues of VSMs (here and here), but this little cutie my husband got me not only sews, she’s also an example of a great vintage toy. The Singer-20 was made from 1910 – 1975. 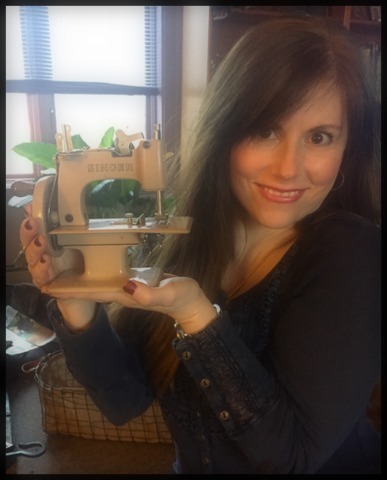 My “Sew-Handy” is from the fifties, with not a speck of plastic! Little girls (and adults, who used it as a “travel” machine) could chain-stitch on this sturdy hand-crank machine. Much of today’s toys are plastic, need batteries or a charge, and don’t allow a child to use much imagination. While I do love my modern vacuum, nothing beats the vintage carpet sweeper I bought for $10.00 at a tag sale. 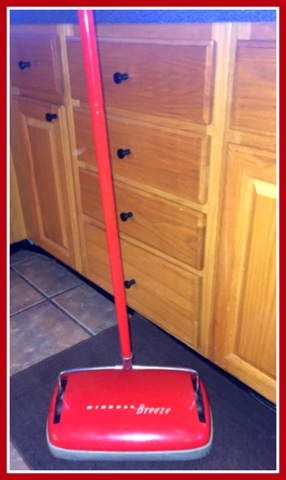 From 1957, the “Bissell Breeze Sweeper” came in my favorite color, red, and originally sold for $9.95. Pristine despite being almost sixty years old, it essentially was new. Belonging to the seller’s mother who wasn’t sure she’d ever used it, he was shocked someone would want to buy it! When I got it home, a little oil on the wheels was all it took to get it working. While my vacuum’s nice, the sweeper clears my throw rugs of debris without sucking/eating them, and makes quick touch ups easy. Metal (but lightweight), it’s charming enough to display. In a kitchen full of gadgets, sometimes blasts from the past are best. At an estate sale last fall looking for a VSM (surprise), I ran across a dusty little box. 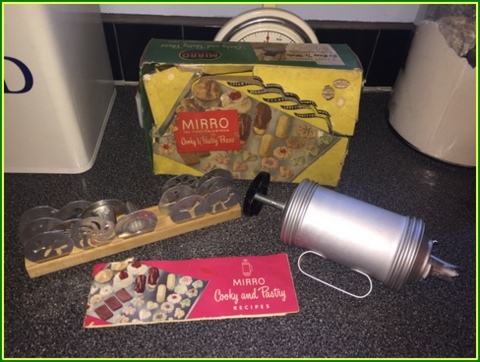 My heart sung when I realized it was a 1951 cookie press/decorator! At $4.00, I didn’t know if it was complete but didn’t care (it was – 15 shapes and a cookbook, to boot – yippee)! I had previously owned two “modern” versions, both plastic and one way more expensive. Both eventually broke. The box looks like it got a lot of use. 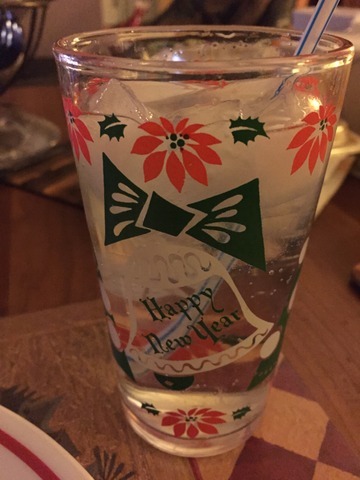 I made Spritz at Christmas (last month, MaryJane posted this awesome recipe), and will use it all year to make appetizers, cream puffs and more. It probably got a lot of use back in the day, but even after using all holiday season, it still looks new, constructed of sturdy aluminum. Vintage Pyrex is popular among collectors. For years, I struggled to make my husband’s favorite cookie that called for using a double boiler. I’d do the double bowl method – not foolproof. I came across a Pyrex glass double boiler, on a Facebook tag sale for $5.00. It made my cookie recipe a delight instead of a chore, and I’m in love with this ingenious little piece of Americana. 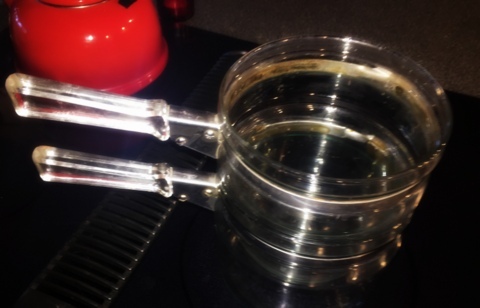 Own a double boiler, and you’ll be surprised how much you really do use it. I recently added a glass-pane antique door with a glass knob to my “sun room”. I love the antique charm in my modern home. As a child, I used to love visiting my grandmother’s little cottage (the sweetest house, on a street named “Cottage”). Inside, I’d marvel at her beautiful doorknobs. 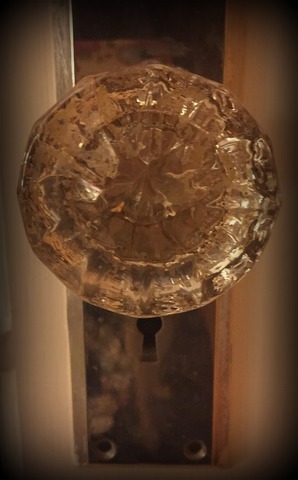 Those sparkly glass knobs resembling giant diamonds are prettier than any modern hardware! One of the most useful tools of the past is a common object, but sadly, it’s difficult to find a “new” one that accomplishes the job it’s made to do. I’ve had hand-held, electric, battery powered, inexpensive, fancy and pricey, but nothing compares to the pencil sharpeners of bygone days! 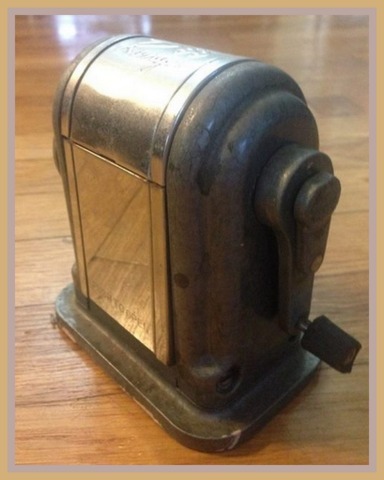 When I was a kid, every classroom had a wall-mounted, hand-crank metal pencil sharpener. They were “old” back then, and I bet decades later those same pencil sharpeners are still working, making perfect pencil points! There’s no comparison to vintage here. I even bought a hand-crank, modern-made metal one. It looked like the ones of my childhood, but all it did was mash and eat our pencils like a crazed termite! One thing all vintage items have is charm. 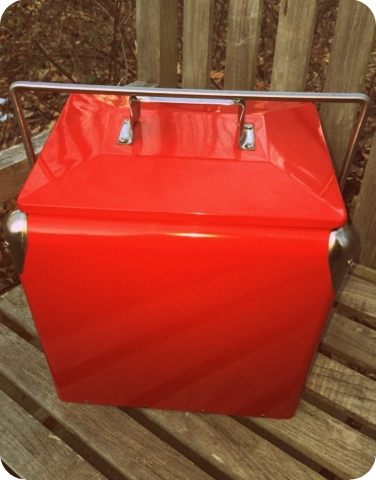 Some things don’t have to be old to be great, like my vintage-inspired cooler. We take it to the beach and use it in the car all summer. During the holidays it sat in the dining room with a red and white bow, stylishly holding seltzers at our Christmas party. More elegant than today’s plastic counterparts, the cute design harkens back to antique coolers, now highly-sought after and often very pricey. Even scratched or dented, they ooze charm. That’s the thing about vintage and antique items from the past: they were made to last and be used, while being visually stylish at the same time. While I’m looking ahead to a new year, I think I’ll still hold on to some of the past. I’m looking forward to sharing another year with you all! Share with me some of your favorite “blasts from the past” in comments!